"Lilith" is a rare limited edition Byul doll. She wears a lacy beige and white gown, a lacy black overcoat, and a spider necklace. In her hands she holds an impossibly tiny "garnet" cross. Her wig is a shocking shade of teal, and she features golden eyes and the palest milky skin. 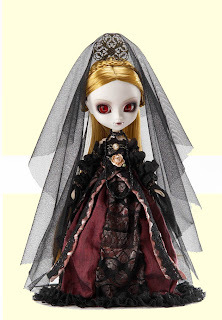 "Elisabeth" is a Pullip depicting a vampire queen or countess. She wears an intricate burgundy and black lace trimmed gown, a black veil, and a crown. Her eyes are blood red, and her hair golden. Check out her adorably menacing little fangs! "Ende" is a DAL doll by Pullip. She is a pouty little vampire, wearing, a brocade red, beige and black gown. Her hair is Claudiaesque in its blonde curliness. All these lovely vampire ladies surely would appreciate the company of a vampire boyfriend, Here's "Nosferatu," a Taeyang doll by Pullip.